I've had a few comments about this on Instagram so I thought I'd do a post detailing how I make it! 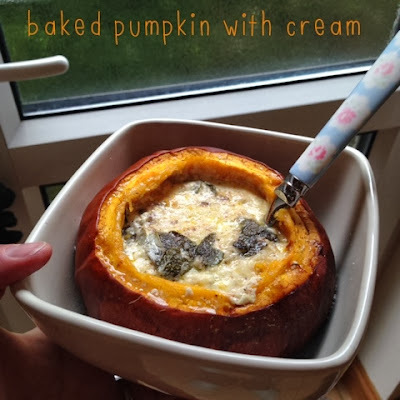 Be warned this is not a recipe for anyone on a low cal/fat diet but it sure takes delicious and is a lovely treat for a cold autumninal day. It's not really as recipe as exact quantities cannot be given, but here's what I do! 1. Heat oven to 140oC, cut top off pumpkin and scoop out seeds. 2. 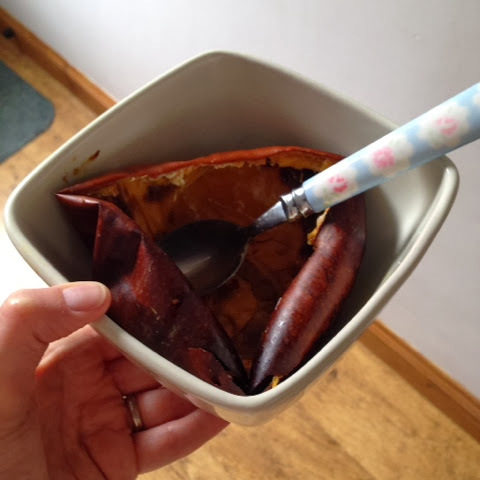 Put pumpkin in an ovenproof dish. 3. Fill about halfway with cheese. 4. Add sage leaves, grated nutmeg and black pepper. 5. 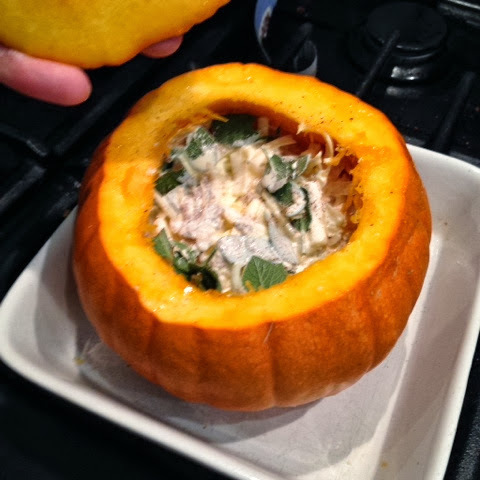 Cover the cheese with cream, pop on the lid and bake. 6. The pumpkin is cooked when the skin starts to burn and when you test with a knife it cuts through the flesh easily - be careful not to pierce the skin though! I've also tried scooping out the flesh and cream/cheese into a blender with a little milk to serve as a soup. If you give this or a variation a try please do let me know, I'd love to hear what you think.